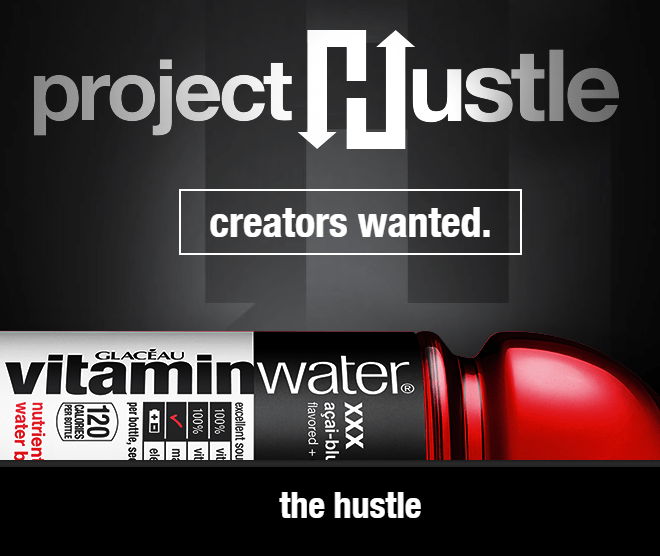 In March, vitaminwater launched Project Hustle, a crowdfunding-inspired program that called on aspiring entrepreneurs, artists-in-training, dreamers and future film directors to prepare their elevator pitch for the opportunity to see their dreams become a reality and the chance to win up to $500,000 (across ten finalists) to bring them to life. The top ten best and brightest ideas were chosen in five categories: music, film, fashion, art and technology. Beginning July 1 through August 31, vitaminwater will put the power into your hands to decide which of these finalists will potentially have their projects funded up to $50,000 each. To fund projects, participating vitaminwater and vitaminwater zero™ bottle caps will contain a code that you can enter online at www.projecthustle.com. Each code holds a specific “virtual dollar” value, which can be allocated to one of the ten finalists’ projects.